Tick boxes off your Australia list with this comprehensive cruise and rail journey around our ruggedly beautiful country. Enjoy the award winning Radiance of the Seas from Sydney to Fremantle with the best collection of port calls. Explore Western Australia with comprehensive touring. Experience the once in a lifetime journey from Perth to Sydney from your private cabin aboard the Indian Pacific. 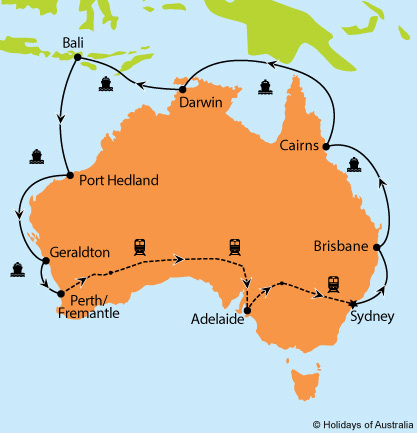 16 nights aboard Radiance of the Seas from Sydney to Fremantle with port calls in Brisbane, Cairns (Yorkey’s Knob), Darwin, Bali (Indonesia), Port Hedland, and Geraldton. Your cruise includes on board meals and entertainment. Transfer to your accommodation with a Half day Perth City Sights tour. Full day New Norcia, Benedictine History, Swan Valley Produce tour with afternoon tea. Full day Margaret River, Cape Leeuwin & Busselton tour. Transfer to the rail terminal. 3 nights aboard Indian Pacific travelling from Perth to Sydney in Gold or Platinum Service. Your journey includes all meals, drinks and off train experiences in Kalgoorlie, Nullarbor, Cook, Adelaide, Broken Hill and the Blue Mountains. *Please note a minimum of 20 passengers are required for this departure to be hosted.